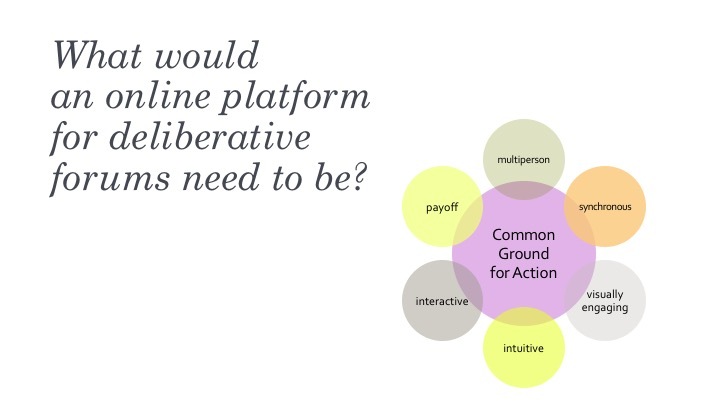 What is Common Ground for Action? 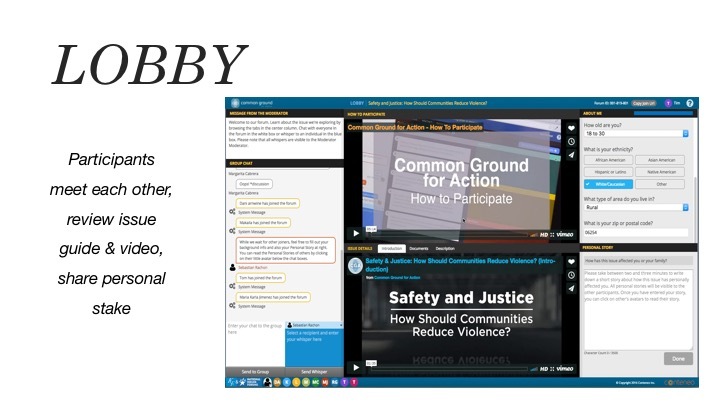 A simple but sophisticated platform for public deliberation online. 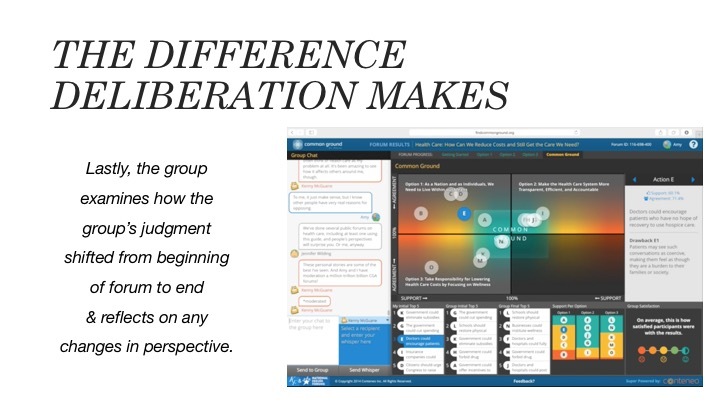 CGA allows small groups to learn more about an issue, examine options for dealing with the issue, weigh tradeoffs, and find common ground, with beautiful visuals that let participants actually see their conversation evolve. All NIF frameworks are available in CGA right now. You can also localize one of our national issues, or even create your own! We all know how tough it can be for people to have useful, civil conversations about controversial issues— especially online. 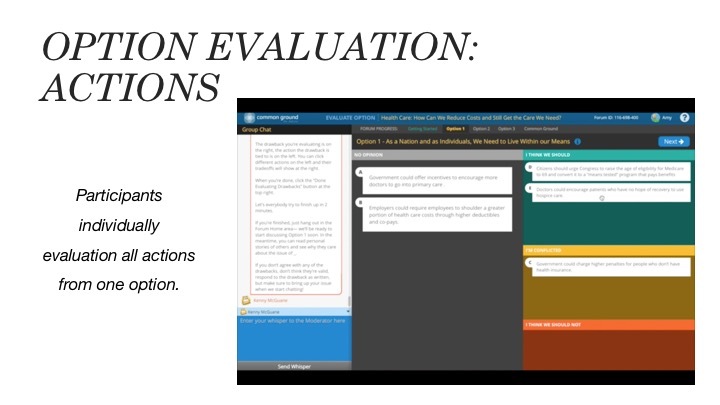 CGA provides a structured way for citizens to have these conversations, to more deeply explore their own judgment on an issue and to better understand the judgment of others with different views. 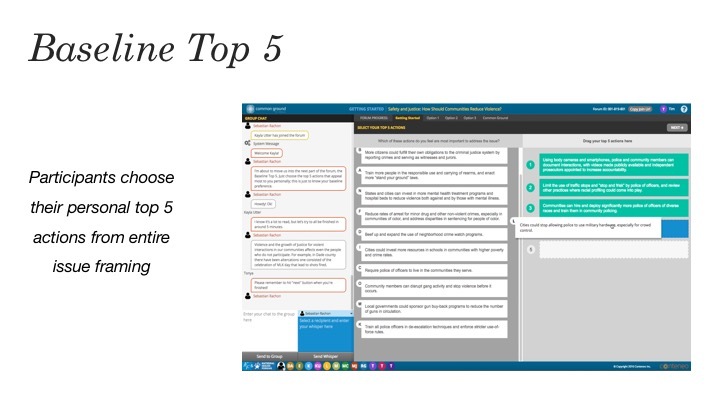 CGA also provides a wealth of easy-to-analyze information about the discussion and the participants that's often hard to capture in traditional engagement methods, making accurate, actionable communication after the forums easier! CGA forums provide insight you can’t get from polls, survey, or even focus groups. They let you know what citizens truly find persuasive about various options, and where they are, or aren’t, open to compromise. 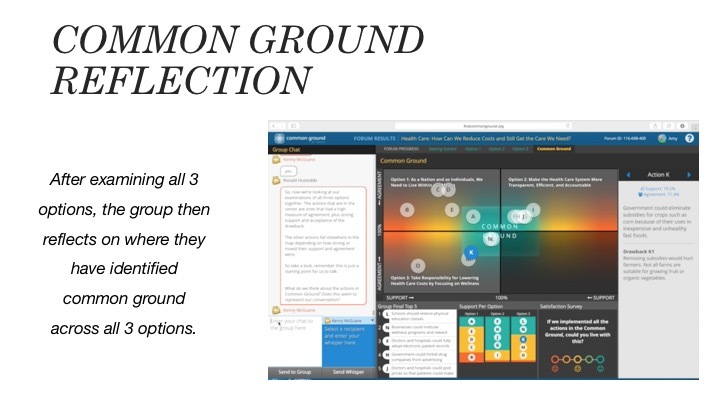 Each forum produces a “map” of any common ground that shows the level of thought-through support for every action from all three options—public judgment information that’s actionable. 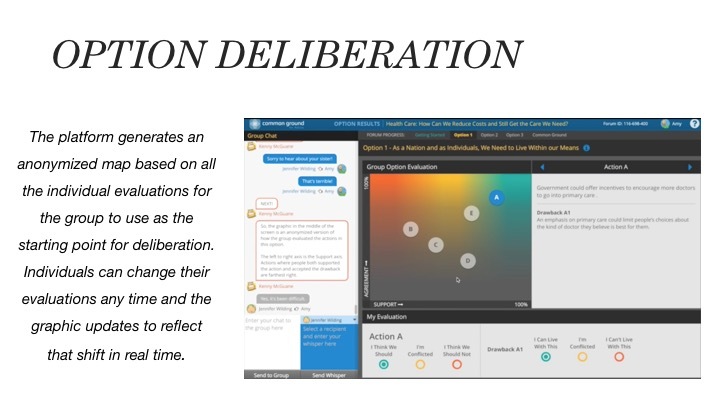 You don’t have to be part of an organization to deliberate with other citizens. Anyone can host a CGA forum if they see a need in their community. 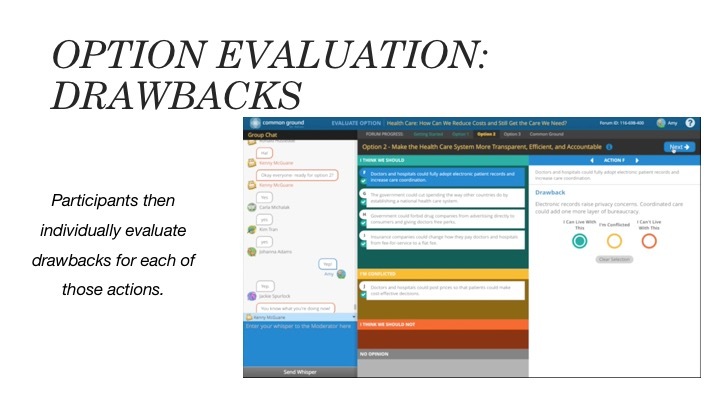 Creating your own local versions of NIF issue frameworks is easy, too! Or you can create your own unique local framing! We will never sell your data, or allow it to be used to identify you. Want to Hold Your Own Forum? Fantastic! You’ll want to either learn to moderate yourself, or draft a member of the NIF/CGA network to help out. In the meantime, check out the issue guides available for use in CGA and our CGA moderator resources. 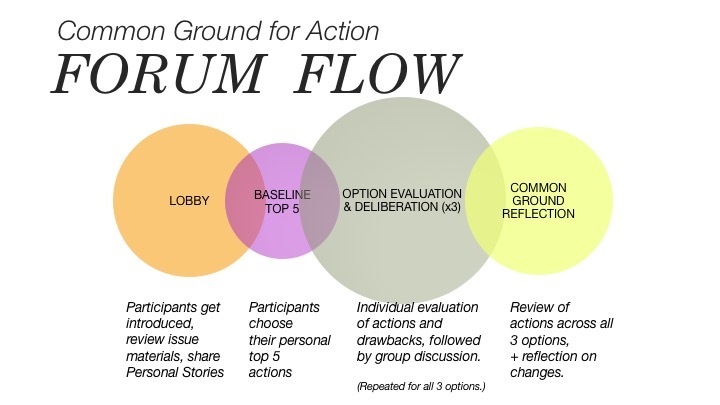 I was invited to a Common Ground for Action forum—how do I get there? The invitation email from your forum convener or moderator contains both a unique URL you can click and go directly to your forum, as well as a 9 digit numerical code that is your Forum ID. You can either enter that URL right in the URL bar, or click the button below and then enter your 9 digit Forum ID. Can I join a forum right now? Anyone can participate in a CGA forum, but CGA forums are initiated by moderators, so you have to either be invited by a moderator or join a forum that has been set up to be as an “Open CGA forum.” Any “Open CGA forum” listed in the Forum Calendar can be joined by anyone who clicks the URL in the event listing. Editing notifications preferences requires a user account.